The crinoidal debris around Dale Hollow Lake is from the Fort Payne Formation of Middle Mississippian age. 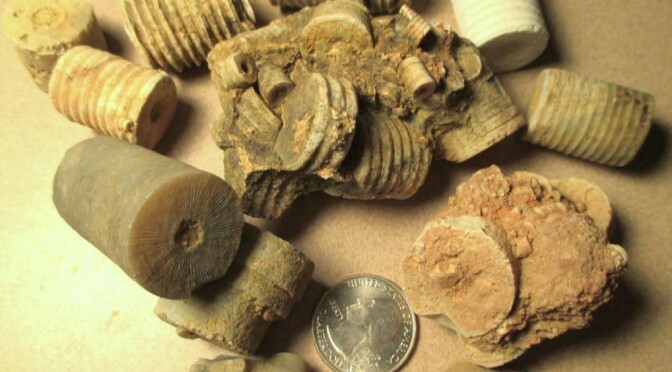 A number of large stemmed crinoids thrived in the seas that covered the Tennessee-Kentucky region in the Upper Mississippian Epoch some 320 million years ago. Krivicich (2011) reported that the most common genus from three sites on Dale Hollow Lake is Agaricocrinus. Without the calyx, species identification is not possible. Actinocrinites is another common genus. Crinoids are marine animals from the Class Crinoidae of the Phylum Echinodermata. Most prehistoric crinoids attached themselves to a substrate with a flexible, circular, segmented stem. Above the stem food filtering arms extend from a cup-shaped body (or calyx). The stem length and calyx size are species specific, but also vary based on the environment. The stems grow as needed to access planktonic nourishment. The broken and segmented stems were comprised of calcite and therefore commonly preserved in the rock record. The softer tissues of the calyx and arms require rapid soft sediment burial to be preserved and are seldom found intact. Although the 30 or so collectors with Linda found stem sections in abundance, there were only 10 identifiable calyces found and Linda found two of them! One shows the pentagonal character of Agaricocrinus (see below). The other may be Actinocrinites. At a second spot, colonized corals were conveniently located in outcrop exposure near Byrdstown, Tn. 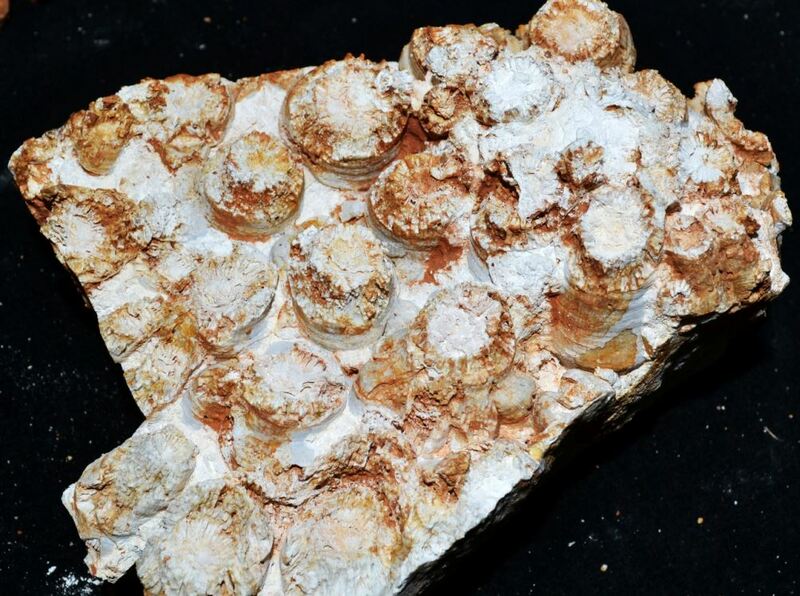 Silicified and somewhat iron stained, these small coral colonies grew with bryozoans in carbonate mounds offshore from the Appalachian Highlands that were rising to the south and east in Mississippian times. A colonized coral from Byrdstown, TN. Individual corals are 0.5-0.8 inches in diameter. Because of their uniformity, pieces of crinoids stems have been threaded onto necklaces for over 1000 years. In England, they are often referred to as St. Cuthbert’s beads (or Cuddy’s) because of their historic importance in medieval Northumberland. Their use in rosaries can be traced back to the 12th century, but at that time their origin was assigned to snakes or “devil’s toes”. Naturalist Martin Lister came closer to the truth when he labeled them as “petrified plants” in 1673. The formation of chert layers and nodules and the silification of fossils such as crinoids within limestones is an interesting process. Silica released from the weathering of silicate rocks is transported in solution where it fills the pores of the limestone and fossils. As the water evaporates with burial, a siliceous gel is formed and with further dehydration, opal (SiO2·xH2O) will begin to encase and replace the carbonate mineralogy of the limestone. 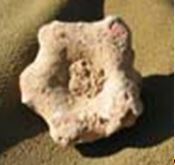 With continued access to silica-laden waters, nodule growth or fossil replacement can proceed to completion. The transformation of carbonates to chalcedony/chert occurs via dissolution and reprecipitation processes that are controlled by time and temperature as well as access to silica-laden groundwaters. I’ve always found that somewhat stingy. No one wants to share info on where other hunters can find fossils but they are all too willing to keep them for themselves (ie ‘”buckets full”). I mean really, how many people out there know what crinoids are or want to collect a few?? Lynn, We collect them by “the bucket full” when they are available so we can give them to kids in as many forums and venues as we can find. I attend at least one outreach event every month and sometimes give away fossils or minerals to as many as 100 kids an event. I only keep a handful, well maybe two handfuls! I think other clubs do likewise. One way we do this is with egg crate mineral collections. I have a story on this on the blog also. We share site locations whenever we can. I did not share this one in Tennessee because it was not our club’s trip and the club running the trip requested that the location not be shared. Good afternoon. I have a place at Dale Hollow in Horse Creek. The place is littered with these. Glad I found the site. It’s answered several questions. Glad you found some useful information on my site. 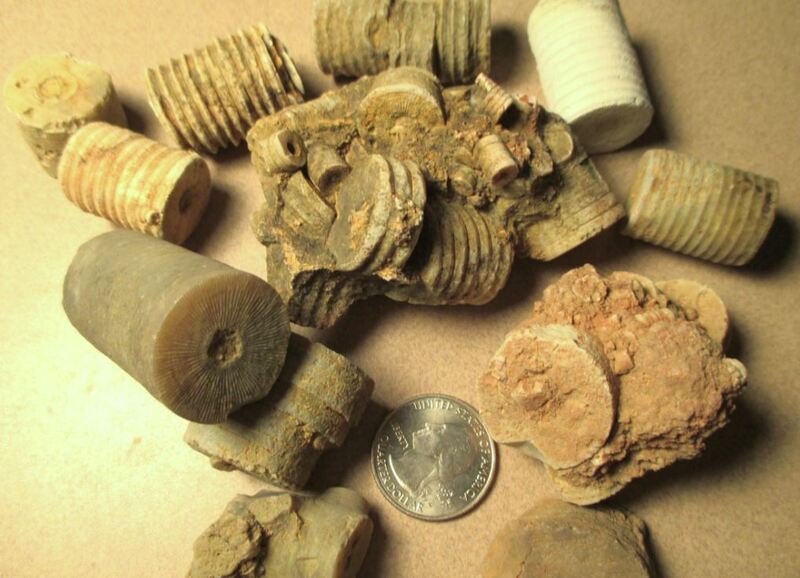 I have actually never been to that area, but since a club member did and came back with lots of silicified crinoids I thought I would research it a bit and write it up. I live in Cumberland City Tennessee,which is part of Stewart County. On Old Highway 149, I received permission to look at a large area used at one time as a source for fill dirt and gravel.In the middle of the field is a narrow exposure of hard to soft gray limestone, the stone formation is verticle with slim slabs of the material protruding several inches from the ground.It has proved to be a rich source of very large crinoid specimens, some species of Brachiopods I have never seen before, and a complete absence of gastropods or coral except for tiny horn coral,and they are rare.The area was also home to an odd little sponge,about the size of a .38 slug,reddish in color with a hollow base.What kind of marine environment does not support coral development but is favorable to crinoids? Dan, I am not sure I have good answer for you, but I think corals are more restrictive in their environment. Both crinoids and corals are filter feeders so they require water with nutrients and cannot tolerate a lot of mud or turbidity. But I think corals also have a more restrictive environment relative to sunlight and perhaps water temperature. Crinoids (at least certain species) may be able to live in deeper water and maybe cooler temperatures. But I am not a paleontologist and so this answer is partly speculative. FYI, I visited Dale Hollow Lake myself just last week as part of a week long trip. So now I have my own crinoids for there! Thank you so much!Some of the crinoid stems are quite large, and if they are trapped in the matrix, you can see the feeder arms that were once attached.The upper slope of this site is devoid of fossils,and only the boulders and the small exposure at the base of the hill has any life forms at all.The tiny sponge is a real mystery,I thought I had seen it all in the thousands of fossils I have collected, but this sponge has me stumped! I cannot find it in any reference source, and my next step is to go to the local university and report my findings.Do you believe the site may be important? My name is Matthew Morgan I’m from Tennessee I went out the other day and found what I think to be a fossil of the first bird like dinosaur archaeology but I could be wrong and I cannot find no one to let me know if I am correct or not I cannot find any specimens like this that have been found in Tennessee if anyone could help me I would much appreciate it. The best way to get something like that looked at is to seek out expertise from the geology department of a local university. Although it is unlikely you found dinosaur fossil material in Tennessee (the rocks in most of the state are too old, Paleozoic Era vs. Mesozoic Era), you never know. You might also see if there is a rock and mineral club in your region of TN. There are Facebook groups dedicated to Fossils and if you posted a good picture you might get input also.